This volume continues the tradition of publishing key presentations from a series of biennial International Conferences on the Ecology and Management of Alien Plant Invasions (EMAPi) beginning in 1992 (see de Waal et al. 1994, Pyšek et al. 1995, Brock et al. 1997, Starfinger et al. 1998, Brundu et al. 2001, Child et al. 2003). The first conference, held in Loughborough, UK in 1992 brought together the latest research and thinking on alien plant management within Europe. Since then, the conference has widened its scope having been hosted in Kostelec nad ?ernými Lesy, Czech Republic (1993); Tempe, Arizona, USA (1995); Berlin, Germany (1997); La Maddalena, Sardinia, Italy (1999); Loughborough, UK (2001); Fort Lauderdale, Florida, USA (2003) and most recently, in Katowice, Poland (2005). The next conference is planned for Perth, Australia in 2007. The number of participating countries and organisations has increased steadily over the years with 150 delegates from over 30 countries and five continents represented at the Katowice conference. This is an indication of the world-wide importance of plant invasions and the need for a global network to exchange research outcomes, ideas and best management practices of invasive plants. Plant invasions are, of course, only a fraction of the whole process of biological invasions concerning marine, freshwater and terrestrial environments, including plants and other living organisms. Another notably parallel conference series has been organised in Europe by the German Working Group on Biological Invasions NEOBIOTA. This group aims to coordinate responses to the ever increasing problems caused by the invasion of alien plants, animals, fungi and micro-organisms, focussing mainly on Central Europe, with its first conference held in 2000 in Berlin, Germany (Kowarik & Starfinger 2000, 2003, Kühn & Klotz 2004, Nentwig et al. 2005). The effects of invasive alien species (IAS) are widespread and pose a significant threat to global biodiversity. The European Union has recognised the proliferation of invasive alien species as an emerging issue, funding the GIANT ALIEN project, which focused on Heracleum mantegazzianum (Pyšek et al. 2007), and the EPIDEMIE project (Exotic Plant Invasions: Deleterious Effects on Mediterranean Island Ecosystems) (Hulme et al. 2007) under the 5th Framework Programme in 2002–2005, as well as ongoing projects addressing biological invasions (ALARM – Assessing Large Scale Risks for Biodiversity with Tested Methods; DAISIE – Delivering Alien Invasive Species Inventories for Europe) under the 6th Framework Programme. During the Environment December 2006 meeting (2773rd) the Council of the European Union called upon the European Commission to assess gaps in the current legal policy and economic framework for the prevention of introduction and for the control and eradication of invasive alien species. Furthermore, the Council invited the Commission, in cooperation with the member States, to prepare an EU strategy and an effective early warning system, on the basis of the Convention on Biological Diversity (CBD) Guiding Principles on Invasive Alien Species. Since the 1992 CBD, this is probably the strongest legal European commitment to address invasive species with legislation and regulatory tools. The United Nations’ 2002 Convention on Biological Diversity (CBD) has recognized an urgent need to address the impacts of IAS and has included ‘Trends in invasive alien species’ with trial indicators to be developed and used for assessing global progress towards the 2010 target of halting biodiversity loss. In this framework, a pan European initiative, Streamlining Biodiversity Indicators by 2010 (SEBI 2010), was launched in 2004. One of the deliverables of this initiative will be the editing of a list of the worst invasive alien species threatening biodiversity in Europe. Some of the species that are present in the SEBI draft list, such as Ailanthus altissima, Carpobrotus spp., Fallopia japonica are the prime subject of papers presented in this volume. At an international level, the Global Invasive Species Programme (GISP) has encouraged countries to recognize that they cannot solve problems connected with biological invasions by working solely within their own administrative borders. By their very definition, IAS are an international problem. Apart from their threat to biodiversity and ecosystem services, invasive species have a significant socio-economic impact. Developing countries are particularly vulnerable to the threats posed by invasive species because their economies typically rely heavily on agriculture, locally cultivated varieties, forestry and fishing. Moreover, within these countries it is generally the rural communities that are most at risk, as their livelihoods are almost solely based on these economic sectors, while the poorest people may be dependent on local biodiversity for food, fuel and construction material (GISP 2007). The number of meetings, workshops and scientific publications on biological invasions is steadily increasing at a global level, seemingly in relationship with the dynamics of the process, and the field has been receiving increasing attention (Pyšek et al. 2006). Actions are now in progress, including amelioration of the legislation, even in those countries where, until recently, the presence of invasive alien plants was regarded as a botanical curiosity. There is now increasingly consolidated knowledge available about best practices for prevention, control, monitoring, risk assessment, and – in limited cases – eradication of IAS. Finally, biological invasions provide an exciting laboratory for ecological studies, e.g. as in the case of geographical or biogeographical islands (Daehler 2006) or concerning the relationships between species invasiveness and habitat invasibility (Richardson and Pyšek 2006). Nevertheless, in total conflict both with the general increasing background knowledge and evidence of actual impacts, species continue to be introduced in many regions of the world without any comprehensive risk assessment. Introductions continue to be made for diverse purposes e.g. as ornamentals in the Mediterranean, for erosion control in China and Asia and to protect from desertification and provide fodder, charcoal and fuel wood in the dry zones of Africa. Furthermore, in many countries, a national legislation framework is lacking showing that continued raising of awareness and education are needed in addition to scientific study. 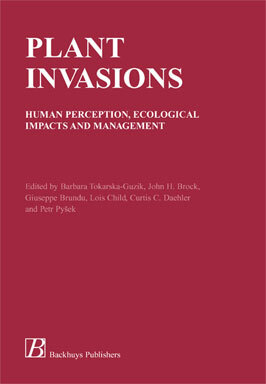 This volume aims to contribute to this growing field, exploring human perceptions of plant invasions and the role of humans in the invasion process from different perspectives and geographical areas. It also covers case studies of the biology and ecology of invasive species, mechanisms of invasion and ecological impacts, while offering solutions through a variety of control and management techniques. The terminology associated with plant invasions is diverse and sometimes confusing. As in the previous volumes, we have attempted to standardize terminology used in this book following suggestions by Richardson et al. (2000) and Pyšek et al. (2004).